After a long flight from Boston with nothing to eat – airlines now charge for awful food that I refuse to pay for- and checking into my hotel, I went looking for a good place for lunch, I was famished! I was fortunate enough to arrive in Oslo on a gorgeous sunny afternoon. There was a lovely breeze so I hoped to find a spot where I could sit outside. I wanted to avoid the tourist places in the harbor so I went into town looking for somewhere locals ate . I wanted to eat what they eat. 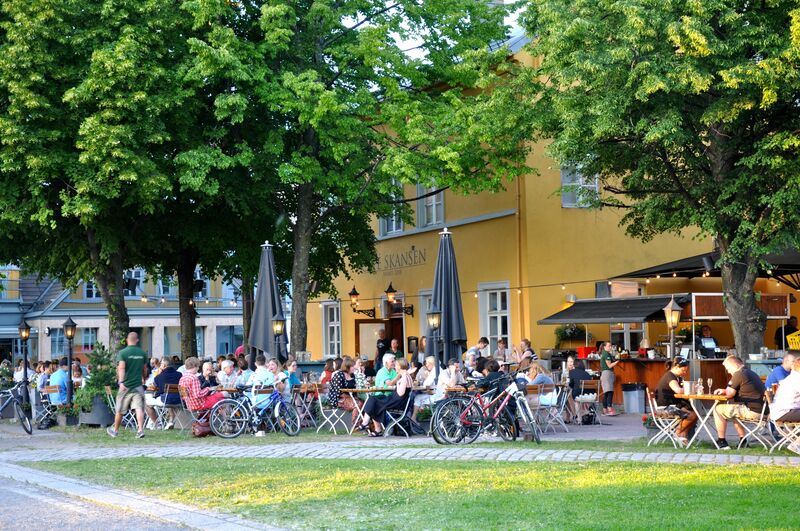 So, after doing some research, I found Café Skansen, a lovely house with an amazing outdoor patio that was pefect for this breezy summer afternoon. The building reminded me of something I would find in Provence – just like Van Gogh’s Yellow House…smack in the middle of Oslo. Friendly waiters, ran around tending lively patrons who drank a lot more than they ate. 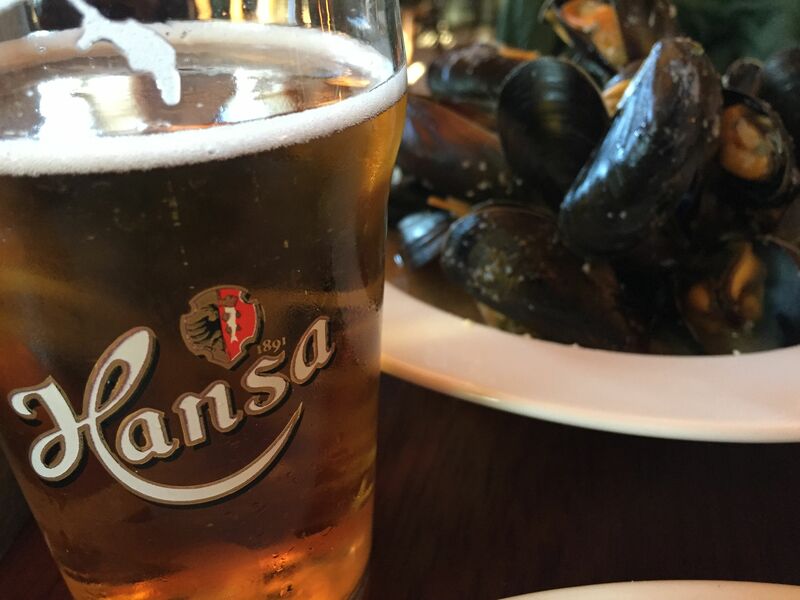 I was hungry and wanted something hearty to go with a nice glass of chilled Hansa beer. 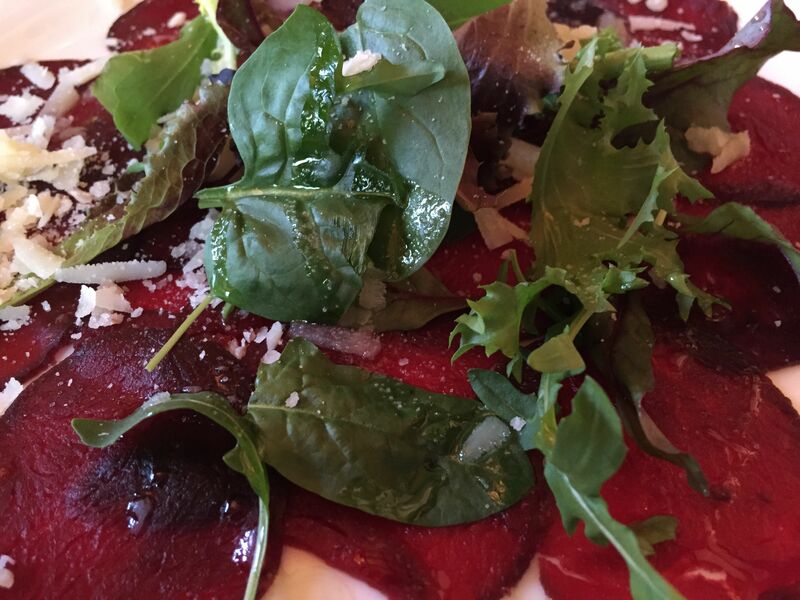 The first thing that caught my eye was one of the appetizers: Carpaccio av hval or Whale carpaccio – “Whale?….Isn’t it in danger of extinction?” I thought. Indeed, but it seems that Norwegians have no qualms about eating it. Well, actually they only consume the Minke whale, a small 25 foot long baleen that is not considered endangered. Regardless, my curiosity won over my conscience – I know, I still felt really guilty but I had to try what everyone called a ” real Norwegian delicacy”- somewhat fatty but more meaty than fishy- delicious! I needed another Hansa to rinse my conscience and move onto the next dish. This time it was something more commonly accepted: Skalldyrsuppe or fish soup. 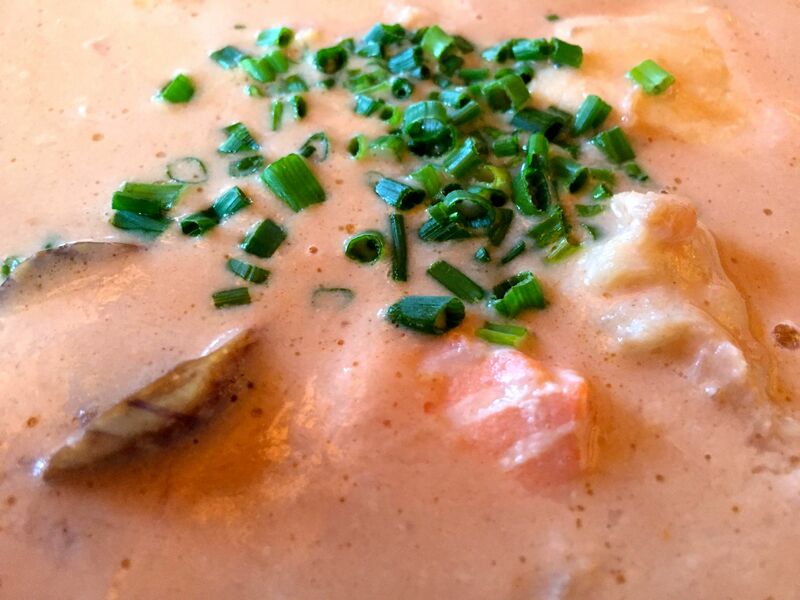 A creamy chowder made with chunks of salmon, halibut, shrimp, clams and mussels. The fish had its skin on and I knew that in spite of contaminants, salmon skin was rich in omega 3 oils but I wanted to know why they left it on. I was told it was just easier to handle and wouldn’t fall apart in the soup. It didn’t matter, it was definitely hearty. I didn’t need anymore food but I had already ordered a main course: Kveite, halibut with potatoes au gratin over creamed asparagus. 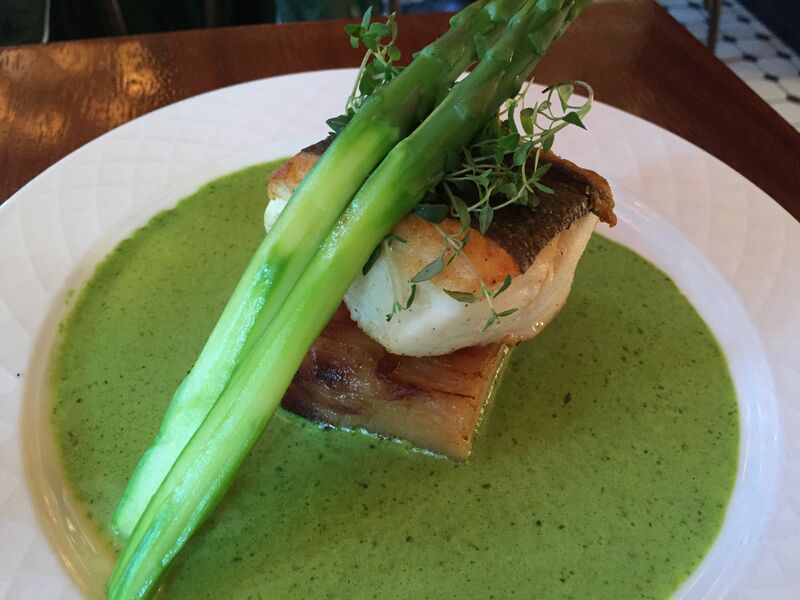 A small portion of flaky halibut baked to perfection that paired wonderfully with the light and airy asparagus foam. Café Skansen proved to be a delightful start to my Scandinavian foodfrisking expedition! I was more than satisfied with my first Norwegian meal and, of course, my first Norwegian beer.